This post morphed into an article that appeared in The Star newspaper. That article was the space limited, Reader’s Digest version, this is the original in two parts. He first came knocking 170 years ago, three weeks ago he was back. With a pencil and an enumeration form tucked in his yellow shoulder bag, the census man arrived to take yet another snap shot of the Smillie family. The man’s name was Festus and his visit marked the latest in a century and a half of census makers who recorded my family’s move from the countryside, to the overcrowded cities of Lowland Scotland, then to the wide skies of South Africa. The first time us Smillies appeared in a census was in 1841. On the night of June 6th, the census taker knocked on the door of a house in Monkton, in South Aryshire. He walked into the poorly lit house and recorded what he saw. His notes from that night survived. There were three inhabitants in this dwelling. The head was my great, great, great great grandmother Elizabeth Smilie, aged 50. The surname incorrectly spelt. 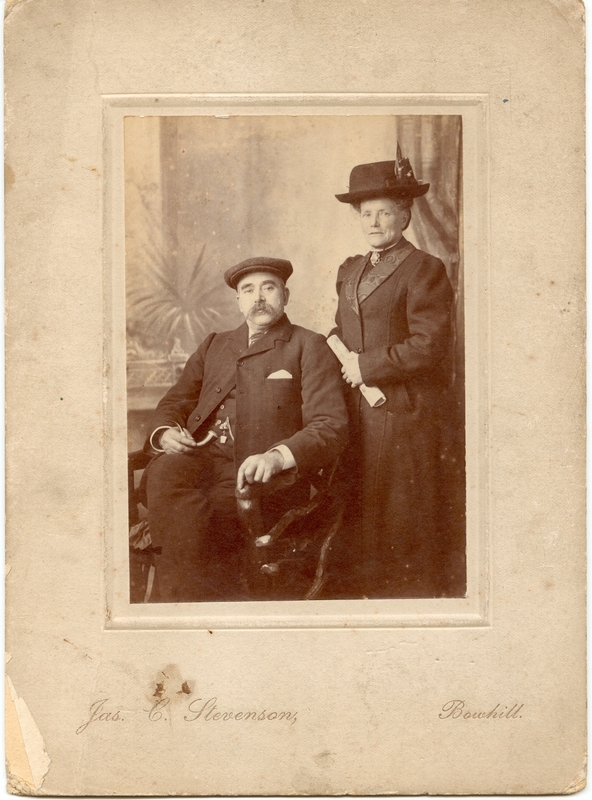 Then there was her daughter Margret aged 25 and her son and my great great great grandfather Joseph. The census man noted that Joseph was a labourer aged 20. What this census didn’t record, was that Elizabeth was a widow, and probably relying on poor relief. Like many Joburgers today Joseph appeared not to trust census takers. He never gave his true age. That first census simply recorded names, ages and occupations, and a general address. Census takers were usually local school masters, but I think this one didn’t see many of Elizabeth’s children. Joseph never signed his name on surviving documents. As an old man, in his late 70s he marked his wife’s death certificate with a simple X.
Joseph Smillie, it appears, never learnt to read or write. On a spring night ten years later, the census man was back. This time he recorded that Joseph was the head of the household. His mother Elizabeth, was living with her daughter, Margret. Joseph was now married to Christina and they were living on a farm calling Little Langlands, near the village of Symington. They had three young children, aged five, three and one and Joseph had lied or the census taker had incorrectly noted his age, at 27. 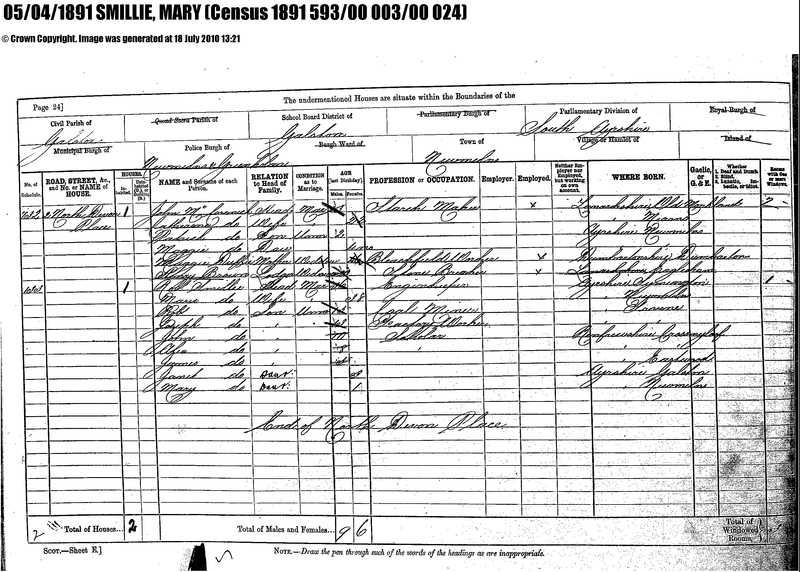 In the 1861 Census my great great grandfather Robert Smillie appeared, as a boy aged 5. He is marked as a scholar. The family was living back in Monkton, and now numbered seven. There was an eight person in the family, but he appeared not to be there on the night of 6/7 April, when the census was taken. Joseph was not recorded. Other documentation has revealed that Joseph by this time had become a mole catcher, a popular agricultural occupation in Victorian times. Mole catchers wore waste coats made from the pelts of quarry and they travelled from farm to farm hunting them. Joseph was probably away from his family on that night, chasing moles. Between 1871 and 1881, my family became part of that army responsible for firing the furnaces, driving the mills and powering the iron works, that forged Britain into a superpower. My great great great great grandma's death certificate. The Smillies were swept up by the industrial revolution that drew them from the pastoral villages of Western Scotland into the slums that ringed Glasgow. By 1881 Robert Smillie, now 26, was a Bread Vanman. A van man was a cart delivery driver. His family, including his wife Mary were living in Pollokshaws road in Cathcart, Scotland. Pollokshaws road, back then, was crammed with overcrowded tenement buildings. His youngest John was just a month old, he is my great grandfather. Counting the nation had evolved in the 40 years, now the census man would arrive the day before, drop off the forms, then pick them up the following day. New questions were added to the enumeration form. The census man now wanted to know if there were any idiots, or lunatics in the house. Thankfully for my immediate family, those two boxes remained unticked. The last census of 19th century, on April 1891, saw Robert in a new occupation. He had become an engine keeper on the mines. His sons were later to follow him into the coal pits. The years past and so did the censuses, 1891 then 1901. On each return families had grown older, moved to new areas, sometimes disappeared from the record, a sign of death. 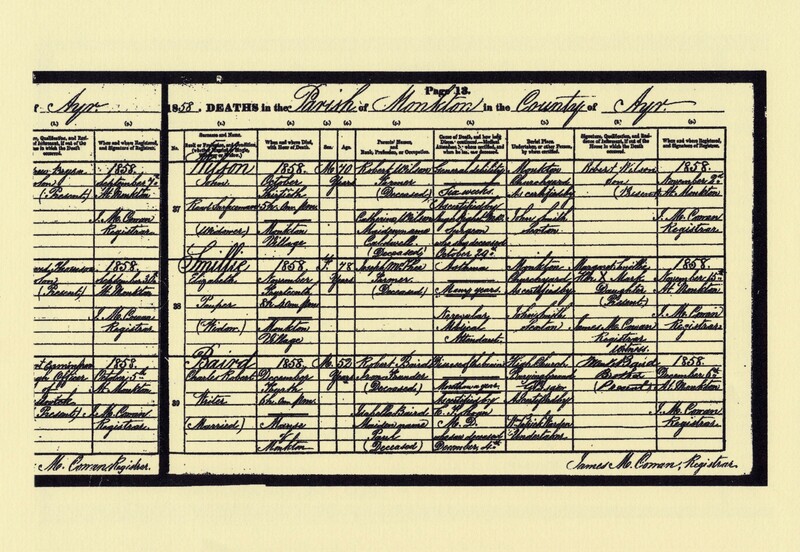 Elizabeth, Joseph’s mother’s name wasn’t on the 1861 census. She died of asthma at 8:40 am, on November 14, 1858. She was 78. Her exact time of death, noted by a Victorian doctor and scribbled on her death certificate. The mole catcher missed the 1901 census by five months. Even in death, he provided an incorrect age. His death certificate had him at 70, he was at least ten years older than that. Ten years later, Britain was a changing place. The Victorian age was no more, the island nation had began its industrial decline and was racing towards a World War. This census would record the names of hundreds of thousands of young men, who would never be counted again. They would die in the trenches of World War One. The 1911 Census would tell more about the Smillie family, but the descendants of those who were counted on that night in May would have to wait. Privacy laws in Scotland prevented the release of census records for a 100 years. On Tuesday 5th April the vaults were opened, the next chapter in the story of the Smillies was available. But this chapter had a mystery. And that is for the next post. 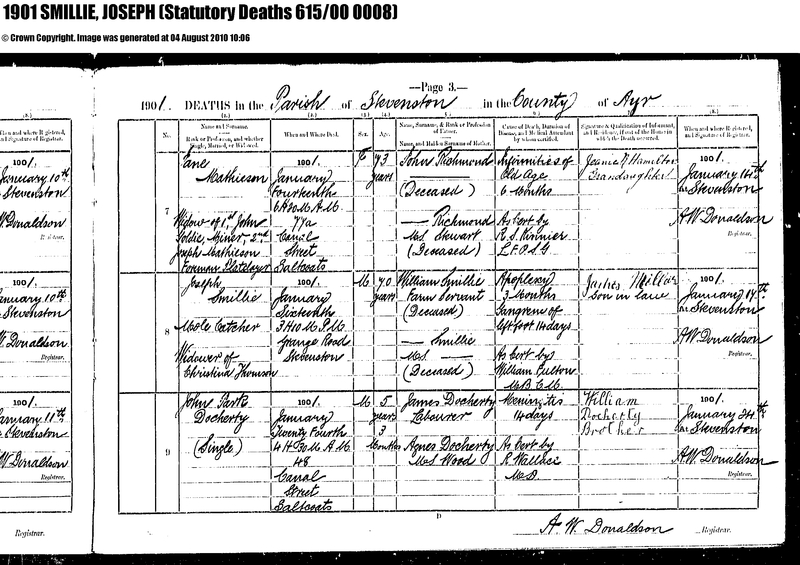 This entry was posted in Smillie family history and tagged Census, Pollokshaws, Robert Smillie, Smillie. Bookmark the permalink.